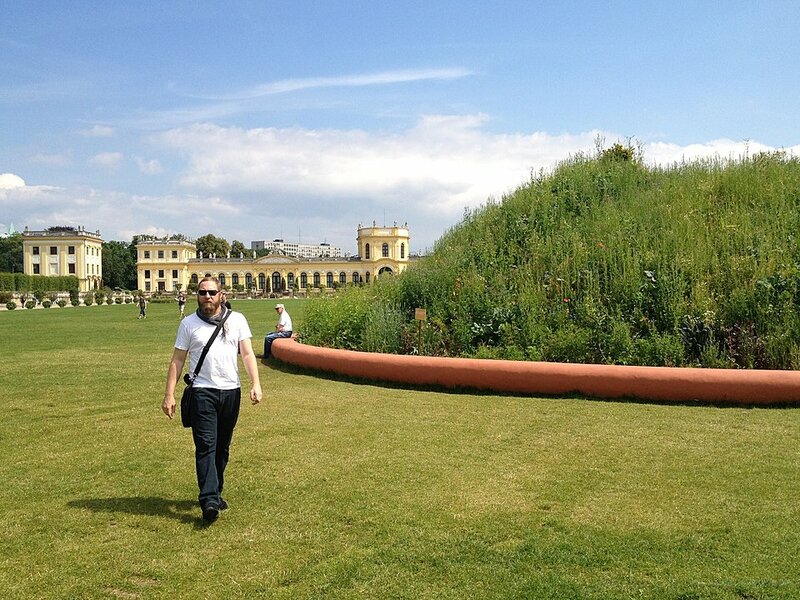 Kathleen MacQueen travels to Kassel to immerse herself into the depths of dOCUMENTA (13). Goshka Macuga. Of what is, that it is; of what is not, that it is not 1, 2012, tapestry, 520×1740 cm. Courtesy the artist; Andrew Kreps Gallery, New York; Kate MacGarry, London; Galerie Rüdiger Schöttle, Munich. Photo by Roman März. Therefore, an exhibition may be conceived as a network of many exhibitions, each shifting continuously between forefront and background, some visible, some invisible, some visible only many years after the event. 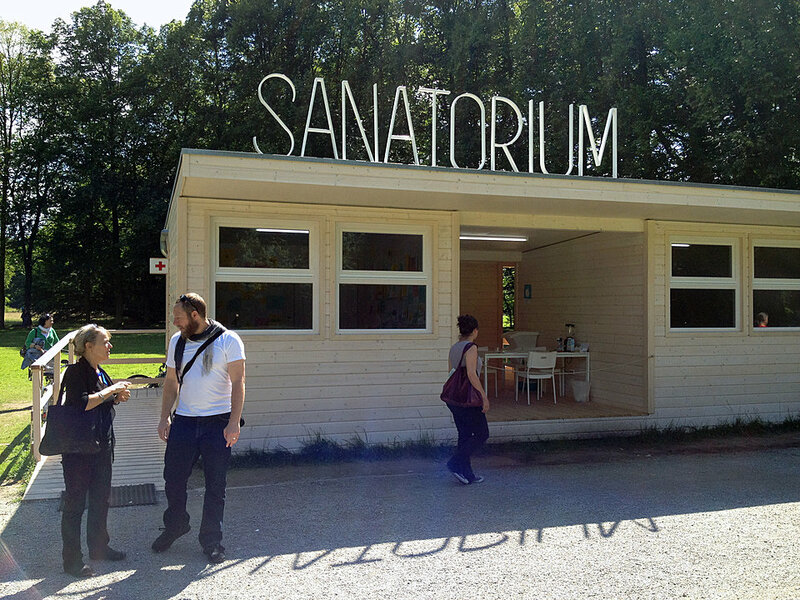 This year’s dOCUMENTA (13) is often confusing, frustrating, and in need of signposts. The installations are so determined by their spaces that they hide among the scientific instruments in the Orangerie, tower in the “grandiose display” architecture of the documenta Halle, and, like travelers between trains, are lost to the expanse of the Hauptbahnhof. A two-day visit, as recommended by the online visitor’s guide, is scarcely enough with distances between venues too great and artworks too complex to absorb in such a short period of time. With ten primary venues and twice as many off the main site, there is a bewildering array of choices: one can choose among a range of dTours and dMaps as guides or get sidetracked as I did, hoping to find satisfaction in unexpected encounters. Is this a new paradigm for exhibition practice? A move away from the nation-building roots of well-orchestrated world fairs, public museums, and international biennials? Or is this simply more expansionism, maintaining the competitive advantage over other art world events? dOCUMENTA (13) is conceived as palimpsest: merging art and life, accumulating ideas and awareness through a variety of cognitive means and interdisciplinary events, exploring not only ways of seeing but also patterns of thought: all possible means of engagement among over 300 participating artists, writers, musicians, scientists, activists, and collectives. No one is gilded with celebrity status, no single venue is more important than another: a non-hierarchical and non-deterministic layout. The difficulty lies in the discrepancy between possibility and actuality; a wide selection does not guarantee kismet. As with friendship, so with art: the relationship can be muddled by distraction. For all its stimulation, I began to consider dOCUMENTA (13) as a case of when-too-much-is-not-enough, when 100 Notes—100 Thoughts over 100 days would have been just fine with 100 artists. Ida Applebroog. I SEE BY YOUR FINGERNAILS THAT YOU ARE MY BROTHER, 1969–2011, installation including journals, UltraChrome ink, paint, Mylar, paper, wood, cardboard, metal racks, variable dimensions. Courtesy of Hauser & Wirth. Photo by Roman März. dOCUMENTA (13) is about the immediacy of experience, yet it is replete with mediating texts from the over 500-page guidebook to the 100 Notes—100 Thoughts , published as pamphlets in the year leading up to the exhibition and then collected in the Hatje Cantz publication The Book of Books . Artistic director Carolyn Christov-Bakargiev has made her notes, a statement, and an essay of intent available to the public. Although reputedly skeptical of words, she opens the exhibition in visual vacuity, directing us instead toward a document. 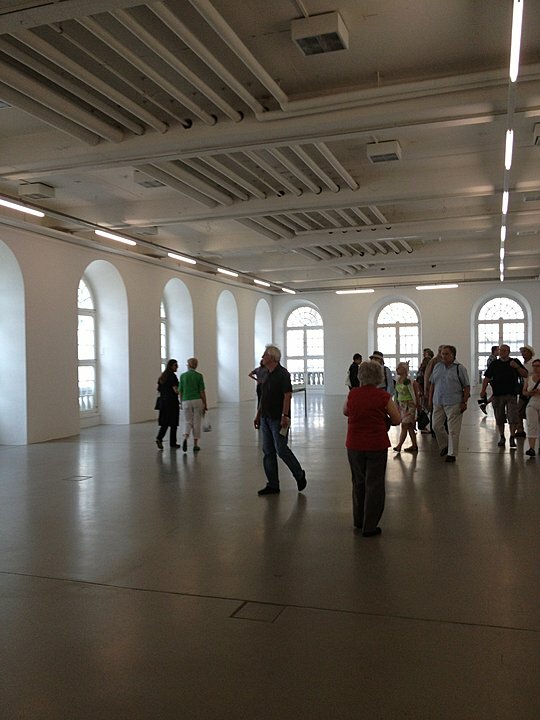 The large square foyer of the Fridericianum—the starting point for any documenta viewer—is empty; so too are the long vast halls to the right and left. A soft breeze—a barely discernible intervention by conceptual artist Ryan Gander—draws viewers toward a solitary display case containing a painfully honest and self-deprecating letter of regret from artist Kai Althoff, who withdrew from the event. This is the heart of dOCUMENTA (13)—an open conversation—and behind in the Rotunda is the brain—a miniature curatorial indicative of the historical connection of documenta to the trauma of war and the recuperative power of art. Indices of the wounds of history are displayed on all three floors of the Rotunda. On the first floor, tapestries by Norwegian artist Hannah Ryggen, which once hung from her window in open defiance of the Nazi occupation of Norway, solemnly condemn the contemporary curtailment of human rights. Etiopia (1935), her angry protest against Mussolini’s invasion of Ethiopia, was displayed at the Paris Expo of 1937 along with Picasso’s Guernica but, unlike Guernica , Etiopia —a domestic tapestry with a subject beyond Europe—did not become part of the collective consciousness (see Marta Kuzma, 100 Notes—100 Thoughts No. 067). 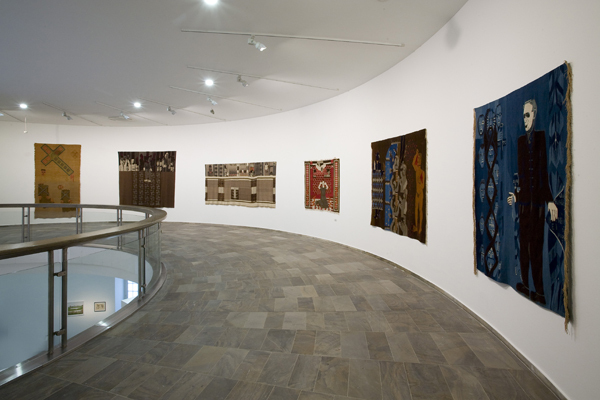 One floor up from Ryggen’s works, another tapestry, commissioned and produced by dOCUMENTA (13), wraps the entire semi-circular surface of the room; its twin occupies a similar crescent in the Queen’s Palace, Kabul. The images digitally collaged into the Kabul tapestry represent the dOCUMENTA (13) staff clustered throughout the Karlsaue park, while its counterpart in Kassel is made up of images taken during a 2012 banquet in the Bagh-e Babur Gardes, which was attended by representatives of the Ministry of Information and Culture, archeologists, workers, journalists, and intellectuals. Set against a background of snow-covered ruins, this panorama is as curious as its title, Of what is, that it is; of what is not, that it is not 1 . Protagoras’s quixotic self-reflection of man as the measure of all things is relayed by the Polish artist Goshka Macuga, the creator of this tapestry, with a degree of skepticism. Protagoras linked virtue with political life, while Macuga leaves us to ponder to what degree such philosophical questions are brought to bear on contemporary actions. Hannah Ryggen. Drommedod (Death of Dreams / Tod der Träume), 1936, wool and linen, 225×272 cm. Courtesy Nordenfjeldske Kunstindustrimuseum, Trondhei. Photo by Roman März. “O my friends, there is no friend”—Aristotle’s declaration was passed down through the annals of philosophy, via Cicero and Montaigne, until Nietzsche inverted it, replacing friend with foe; Derrida used the contradiction to posit a politics of friendship. The discourse of politics today is a discourse on the relation between singularity and community: those included and those excluded, cast out into what Giorgio Agamben would call the conditions of “bare life.” In a film and installation in the documenta Halle, Moon Kyungwon and Jeon Joonho endeavor to renegotiate the conditions of a life veering towards oblivion, while upstairs Yan Lei transforms a warehouse of industrially-produced figurative paintings into monochrome minimalism by retiring one painting each day to a local automotive factory for refinishing and then returning it to the inventory. Yan Lei’s cold aesthetic analysis of image saturation has little in common with the poetry of color and line that Etel Adnan sweeps into her obsessive observation of nature or Tarek Atoui’s intense revitalization of sound and energy through self-made instruments. His real-time improvisations shed control, loosening divisions between performance space and audience. Presentations require a frequent adjustment of mood and concentration. The angry humanism of Ida Applebrog’s narratives against sexual abuse infiltrates a storeroom-like setting of accumulated pamphlets, prints, and paintings; Kader Attia’s post-colonial analysis of the wounds of war and occupation—assemblages of anthropological artifacts and documentation—accumulate unsteadily on industrial shelving. In contrast, a lone drawing by Gustav Metzger, which he made in the early 1950s before composing his “Manifesto of Auto-destructive Art of 1959,” decries its banishment in discrete wounds of folds—the result of decades of storage in a humid suitcase. Anton Zeilinger. Quantum Now, dimensions variable. Courtesy Fakultät für Physik, Universitat Wien, Vienna. Photo by Krzysztof Zielinks. The questions of physicists are remarkably similar to those of philosophers and artists: Is the act of recognition reflected physically in the universe? Does interference impact actuality? What is the basis of reality? Isn’t culture then our guide? Can’t an exhibition—or “many exhibitions each shifting continuously”—shape a discourse? Christov-Bakargiev writes in Letter to a Friend ( 100 Notes—100 Thoughts No. 003), that “to make an exhibition into a meaningful experience for the audience is complicated.” An exhibition must present a multiplicity of positions and provide a diversity of opportunities, but it must also form its own temporary commons—a place of shared engagement. This seems to be the case here for the participants more than for the visitors. dOCUMENTA (13) eschews certainty, presents the impossibility of reducing art to a single paradigm, and questions our reliance on words. But what are words if not one means to localize meaning along with images, sounds, gestures, and actions? Walter Benjamin once wrote, “Words are sails; the way they are set turns them into concepts.” We might presume, then, that concepts give us movement and direction—but in Kassel, at least, these concepts are difficult to discern. Kathleen MacQueen writes on contemporary art and has published essays and reviews in The Art Book , Seachange Journal , Art Criticism , and the Journal of Multicultural and Cross-cultural Research . dOCUMENTA is considered one of the most important recurring exhibitions in the world. A curated exhibition that takes place every five years in Kassel, Germany, it is a dream come true for anyone who likes conceptual art. While hype for dOCUMENTA (13) began years in advance, reviews of past dOCUMENTAs have been wildly mixed, heightening my excitement and leaving me completely unsure of what to expect. This year’s expansive 100 day exhibition not only reaches into parks, forests, plazas, bunkers, galleries, museums, train stations, parking lots, coffee houses, cinemas, and fountains, but also includes concurrent programming in three locations: Kabul, Afghanistan; Alexandria, Egypt; and Banff, Canada. 193 artists participate in Kassel alone this year (with about 300 total participating for dOCUMENTA, including the other locations.) Selections ranging from the dead and famous, like Man Ray, to the young and popular, like London’s Ryan Gander, make the artist list resemble a pantheon of worldwide artists. 1) Under siege. I am encircled by the others, besieged by the others. 2) On retreat. I am withdrawn. I choose to leave the others. I sleep. 3) In a state of hope or optimism. I dream. I am the dreaming subject of anticipation. 4) On stage. I am playing a role. I am a subject in the act of re-performing. And this is as close as you’ll come to a dOCUMENTA theme. In preparation for the visit, my German friend, Georgia, came with me and rented us both bikes in Kassel. Without them, we would have hardly come close to seeing a quarter of the Kassel installations. However, while I expected to be exhausted after three full days of dOCUMENTA, I felt surprisingly invigorated. The travel between installations all across the town, a very physical experience of dOCUMENTA’s ongoing dialogue of time and space, helped clear the mind and re-energize the senses. Ryan Gander’s I Need Some Meaning I Can Memorise (The Invisible Pull), 2012, Fridericianum. A gentle breeze pulling the spectator through the gallery space, dimensions variable. Courtesy Annet Gelink Gallery, Amsterdam; gb agency, Paris; Johnen Galerie, Berlin; Lisson Gallery, London; TARO NASU, Tokyo. Commissioned and produced by dOCUMENTA (13) with the support of Groupe Galeries Lafayette, Paris. Photo by Nils Klinger. To avoid the pouring, frigid rain on the first day, we started with the Fridericianum, Kassel’s main museum and typically the main venue of dOCUMENTA. We entered into Ryan Gander’s I Need Some Meaning I Can Memorize (The Invisible Pull), a gentle breeze running continuously, with no obvious start or end point, throughout the ground floor, allowing the viewer to steer their own course. I imagined this would be a subtle and intimate experience (the spectator in Nils Klinger’s photograph featured in this article appears serene), in which visitors in-the-know could watch newcomers’ hair flutter as they pass from room to room, but for us it felt like a wind tunnel whirling ice down our necks. Protected from the breeze, but still on the ground floor, was the glassed-in “brain” room filled with small objects, artwork, and artifacts acting as a cornerstone for the many angles from which dOCUMENTA could be perceived. Although there were dozens of large and stunning installations throughout Kassel, some of the tiny gestures from this room, described below, proved the most memorable. Tamás St. Turba’s Czechoslovak Radio, 1968, 1969-2012. Photo by Katherine Cohn. Tamás St.Turba’s brick “radios” are nothing but bricks with markings where the antennas were attached to resemble real radios. In 1968 Czechoslovakia, thousands of these “radios” were made in creative protest of the Russian military decree barring the public from listening to radio broadcasts. Thousands were confiscated despite their complete uselessness as communication devices. In the exhibition, St. Turba asserted that these objects represent “the mutation of socialist realism into neo-socialist realism: a non-art art for and by all” and reproduced as an unlimited multiple. A feat of haunting curatorial assemblage in another section included a selection of various editions of Man Ray’s Object to be Destroyed/Object of Destruction/Indestructible Object, each consisting of a ready-made metronome affixed with an image of his lover Lee Miller’s dreamy eye. These editions were made after the lost/destroyed original of 1923. Sitting static, frozen in time, these eyes stare from the upper shelves of a traditional display case, above an assortment of Hitler’s personal belongings, including his monogrammed bath towel. Facing these heavily charged objects on a wall only a few feet away, was a series of portraits of Lee Miller herself (taken by photographer David E. Scherman) bathing in Hitler’s bathtub the day of his suicide, “washing herself of his crimes,” and featuring the same monogrammed bath towel. This riveting study on the healing power of art physically draws the viewer, as in Gander’s work, into the paradox of being simultaneously the subject of a gaze and the gazer. Kader Attia’s The Repair from Occident to Extra- Occidental Cultures, 2012, “The Repair”: genuine artifacts from Africa; “Repair as cultural anthropophagy and resistance”: video films, vitrines, artifacts from Africa and Europe, medical and military elements from World War I; “Relecture”: life-size sculptures in wood and marble, plinths; dimensions variable. Commissioned and produced by dOCUMENTA (13) with the support and courtesy of Galleria Continua, San Gimignano/Beijing/Le Moulin; Galerie Christian Nagel Berlin/Cologne/Antwerp; Galerie Krinzinger, Vienna. Further support by Fondation nationale des arts graphiques et plastiques, France; Aarc— Algerian Ministry of Culture. Photo by Katherine Cohn. Elsewhere, Kader Attia’s installation, The Repair from Occident to Extra-Occidental Cultures, 2012, composed a grand-scale visual essay on ethical and aesthetic concepts of “repair.” We entered into a low-lit room with a small slideshow to the right and a long wooden display case behind, both presenting Attia’s concept of “cultural re-appropriation” including necklaces, frames, and letter openers made from empty bullet cases—mostly domestic objects re-using artifacts of colonization and war. The room opened into a spotlighted series of stacked metal shelves showcasing contemporary African sculptures of European soldiers who received plastic surgery for war wounds in World War I, and, in ironic contrast, contemporary African sculptures of Africans with scarifications and what appear to be animal-mauled faces. At the end of the room, past the metal shelves, was another slideshow, uniting all the images of scarification, artifact repair, plastic surgery, and decorative objects re-purposed to question the Western illusion of perfection and post-traumatic healing. Detail of Pierre Huyghe’s Untitled, 2011-2012, alive entities and inanimate things, made and not made, dimensions and duration variable. Commissioned and produced by dOCUMENTA (13) with the support of Colección CIAC AC, Mexico; Fondation Louis Vuitton pour la création, Paris; Ishikawa Collection, Okayama, Japan. 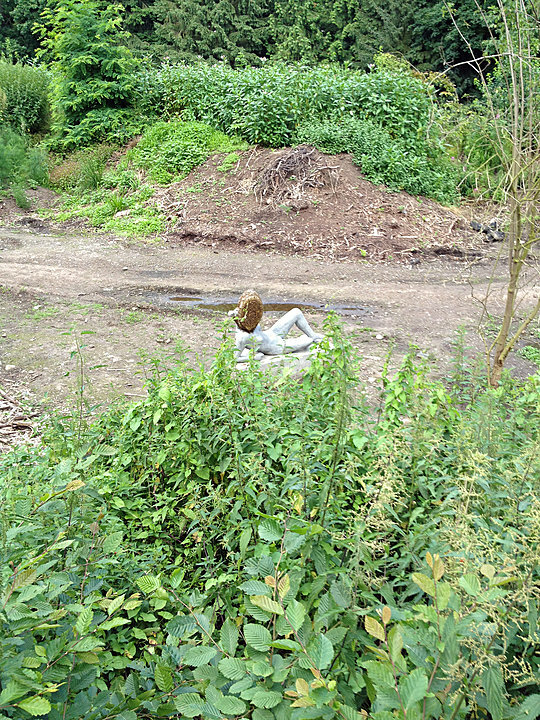 By courtesy of Pierre Huyghe; Marian Goodman Gallery, New York – Paris; Esther Schipper, Berlin. Photo by Nils Klinger. And as long as this world appears as a world “we don’t care for,” it also becomes an impoverished world, a world of minds without bodies, of bodies without minds, bodies without hearts, expectations, interests, a world of enthusiastic automata observing strange and mute creatures; in other words, a poorly articulated (and poorly articulating) world. In my opinion, there should be no question about this year’s dOCUMENTA (13). It is spectacular even in the rain, and I encourage all my friends to try and make it before time runs out. dOCUMENTA (13) will be on view until 16 September 2012. Top photo: View of the Orangerie in Karlsaue Park, during dOCUMENTA (13). The row of potted cypresses is Maria Loboda’s moving forest, The Work is Dedicated to an Emperor, 2012. Farther back is Song Dong’s Doing Nothing Garden, 2010-2012, comprised of flora growing on a six-meter high mound of biological garbage, forming a superficial bonsai mountain with neon signs reading “doing” and “nothing.” Photo by Georgia Böckel. We’re in an age in which the proliferation of global biennial exhibitions and art fairs has, lamentably, created a culture around contemporary art where distinctions are becoming barely discernible between exhibitions (driven bycuratorial theses and historical context) and art fairs (shaped by market demand and trends in consumer consumption). dOCUMENTA (13) provides a welcome and refreshing departure. In marked opposition to the economic forces that have dominated the contemporary landscape for more than a decade, dOCUMENTA (13) curator Carolyn Christov-Bakargiev offers a vision that is fiercely skeptical of the “persisting belief in economic growth,” organizing one of the most earnest and authentic surveys of contemporary art in my recent memory. 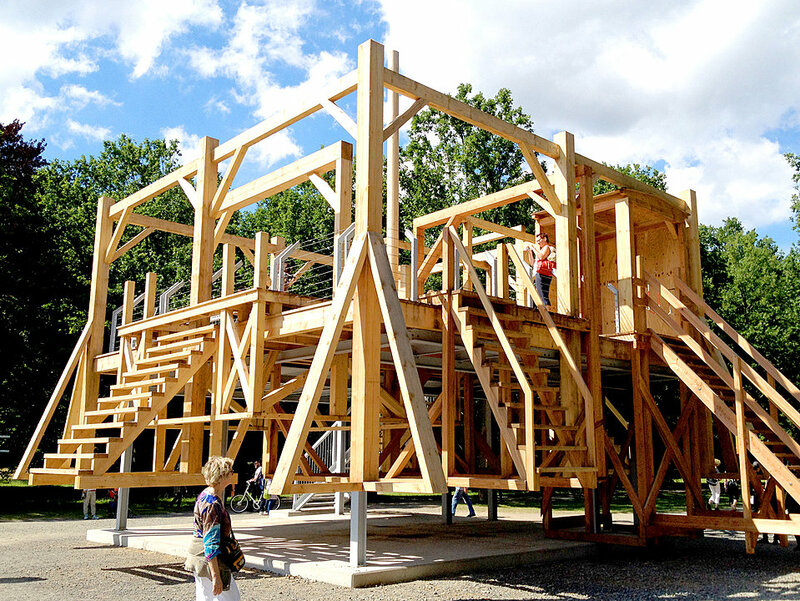 Emphatically for and about artists and all forms of creative pursuit, experimentation, and inquiry, dOCUMENTA (13) affirms the valuable and necessary perspective that creative members of our society bring to life and to an understanding of our complex, multifaceted existence. It elevates artists, providing a deep and penetrating lens into the myriad things they consider, examine, and do as they respond to, reframe, and reflect on the world we inhabit and collectively create. This sprawling survey, which takes place every five years in Kassel, Germany, presents work by more than 300 artists, writers, and performers as well as research by leading scientific thinkers in fields including genetics and quantum physics. Decidedly more expansive than exhibitions of past decades, the 2012 edition includes many new commissions and projects, sited both indoors and out, and spread across multiple venues throughout the city of Kassel, including the Karlsaue public park (which hosts more than 50 projects), movie theaters, museums, and historic houses. dOCUMENTA (13) also has three major satellite sites in Kabul and Bamiyan, Afghanistan; Cairo, Egypt; and Banff, Canada. The exhibition in Kassel will be on view through September 16, while the other venues will host a range of artistic retreats, lectures, screenings, seminars, exhibitions, and live performances on select dates throughout the summer. The artist list for dOCUMENTA (13) is not comprised solely of the “usual suspects” frequently seen on the global biennial circuit, although some familiar names are present—including artists well known to Walker audiences, such as Allora & Calzadilla, Paul Chan, Sam Durant, Trisha Donnelly, Theaster Gates, Pierre Huyghe, Julie Mehretu, Pedro Reyes, Tino Sehgal, and Haegue Yang—as are a few artists from recent documentas, among them Amar Kanwar and Sanja Iveković. While this documenta does present some singular works by a number of well-known artists—Gates, Huyghe, Sehgal, and Allora & Calzadilla in particular stand out—it tends to showcase artists who are less well known and encompasses many new voices. It also focuses on individuals who have resisted easy categorization throughout their careers or positioned themselves outside the established art world—artists such as American expatriate Jimmie Durham and Los Angeles–based Llyn Foulkes. For more than five decades, Foulkes has been making large three-dimensional painted tableaux and performing a one-man show on his self-made musical “machine.” For dOCUMENTA (13), he performed during the opening weeks and presented two tableaux, one incorporating a TV set and a dead cat titled The Last Frontier (1997–2005), which depicts the United States in a state of utter devastation and decay. dOCUMENTA (13) also includes a number of artists from the Middle East and countries in Asia not typically represented, including Thailand, Vietnam, and Indonesia. There are tributes to many deceased and underrecognized artists from around the world, many of them women, including Emily Carr of Canada and Margaret Preston of Australia, and others born in the late 19th century. The show also contains artifacts from antiquity, contemporary aboriginal painting, woven tapestries, and other decorative objects of aesthetic and historical interest as well as cultural artifacts appropriated, transformed, destroyed, or “disguised” during times of war and global conflict. Experiments by DNA epigenetic theorist Alexander Tarakhovsky and quantum physicist Anton Zeilenger are also on view. Her conception of dOCUMENTA (13) is further distinguished by a clear understanding of the survey’s history and context as a post–World War II phenomenon originating in Kassel. This German town northeast of Frankfurt is home to one of the first public museums and theaters in Europe, the birthplace of the Brothers Grimm, and the site of a Nazi labor camp. Since 1955, Kassel has played a role in the Germany’s postwar reconstruction. It was then that the city began to host this episodic survey of contemporary art, advancing a form of German cultural diplomacy. In the exhibition’s main space, located in the Fridericianum (documenta’s main exhibition hall), Christo-Bakargiev pays homage to the first edition of documenta and its intent by re-creating an installation by the late Spanish sculptor Julio González. It serves as a historical marker and echo, of sorts, which remind us of the intentions of an age that sought to showcase a decidedly post-1945/post–World War II view of the world and European culture. To activate local history, Christov-Bakargiev encouraged participating artists to freely respond to the city, its resources, and its stories. 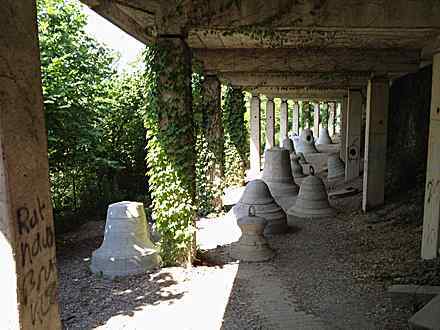 Nedko Solakov created an installation inside the Brothers Grimm Museum; Mark Dion realized a commission in the Ottoneum, the city’s natural history museum; Guillermo Calzadilla and Jennifer Allora took over part of a Nazi-era bunker; Adrián Villar Rojas placed plaster and concrete sculptures throughout a terraced public garden; Theaster Gates inhabited the historic Huguenot House with artists and laborers; and Matthias Faldbakken created a temporary installation in the city’s main library amid the book stacks. 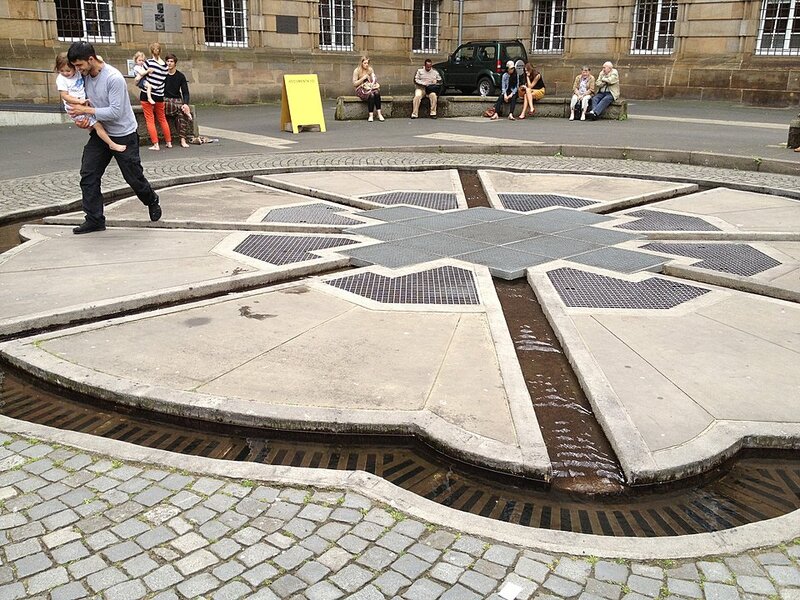 The curator also included a fountain by Kassel-based artist Horst Hoheisel, first completed in 1987. Hoheisel’s Negative Form is an “anti-monument,” a negative copy of the original fountain that was destroyed by the National Socialist Party in 1939, and which the artist literally embedded into the public square across city hall. By including the fountain, which is activated by a rush of water below ground, Christov-Bakargiev brings striking focus to this powerful public artwork—a piece that has gone relatively unnoticed by the international visitors to Kassel every five years. 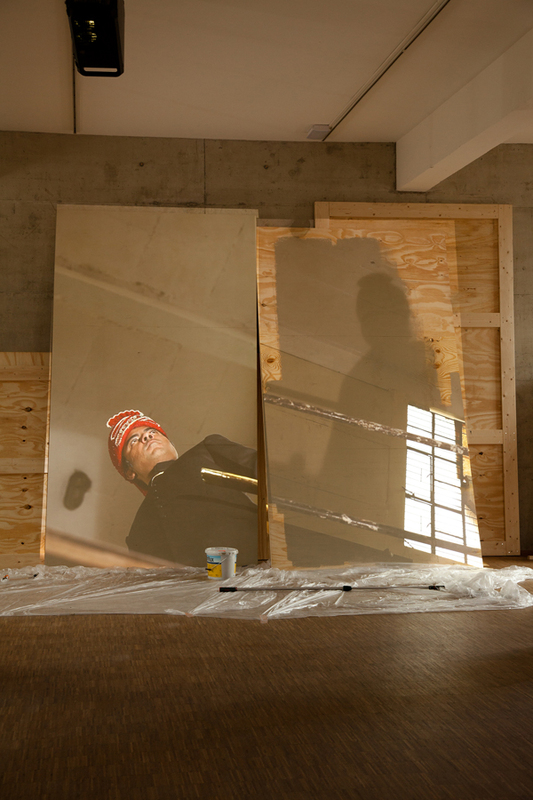 She drew further attention to Hoheisel’s monthly maintenance process, by adding his ritual cleanings (which he has independently financed the past 25 years) on the eleventh of each month to the dOCUMENTA (13) performance schedule. While Joseph Beuys’ more familiar participations from documentas past were not explicitly called out by the curator this year, I was decidedly more conscious of the residues of his legendary 100 lectures (one given each day of documenta) and found myself counting the now stately trees and weathering stone markers of the artist’s seminal 7000 Oaks project around Kassel’s Friedrichsplatz. Several artists took on Kassel’s war-torn history directly, most notably Croatian artist Sanja Iveković, who was the subject of a recent survey exhibition at MOMA New York as well as a documenta 12 participant. For dOCUMENTA (13) she researched the archive of a forced labor camp near Kassel, where many eastern Europeans were detained between 1940 and 1945. The Disobedient (Reasons for Imprisonment) (2012) presents some of the disturbing and mundane reasons listed in the archive as posters sited in public places throughout Kassel. The Disobedients (The Revolutionaries), an installation in Kassel’s Neue Galerie, pays homage to familiar revolutionary figures around the world and across time who have fought oppressive regimes, often at their own demise. In the same way that Christov-Bakargiev acknowledges the show’s specificity as a survey originating in Germany and specifically taking place in Kassel, she dislocates these German and European narratives by weaving in discourses from other centers of the world in conflict, most notably in the Middle East. Afghanistan takes center stage as a place of special curatorial and artistic focus. Indeed, several artists, including Ryan Gander, Giuseppe Penone, Mario Garcia Torres, Walid Raad, and Goshka Macuga, made or performed related works in both Kassel and Afghanistan. Among the most poignant and personal reflections on Afghanistan, and Christov-Bakargiev’s curatorial theses around place, desire, and displacement, was produced by Mexican artist Mario Garcia Torres. His project was inspired by the late Italian Arte Povera artist Alighiero Boetti, whose major survey is currently on view at the Museum of Modern Art in New York. In this multidimensional research project, Garcia Torres seeks to find Boetti’s mythical One Hotel in Kabul to understand what it might look like and how it might function today. One Hotel, the temporary residence Boetti occupied between 1971 and 1977, was the site where many of Boetti’s embroidered maps were woven in collaboration with Afghani and Pakistani women, including his first Mappa of 1971. Legendary curator Harald Szeemann sought to include the piece in his seminal 1972 documenta, but the work was in the end not available. Boetti’s original Mappa is part of Garcia Torres’ installation 40 years later, along with Szeemann’s correspondence with Boetti and a narrated slideshow in which the artist describes his Internet and archival research into the hotel’s existence and photographic history. Garcia Torres’ poetic ruminations about place are accompanied by a series of faxed letters in which he reports his imagined journey and engages in a fictional dialogue with the late artist, who died well before the Taliban regime and US invasion of Afghanistan. Garcia Torres eventually found One Hotel. He made repairs to the site and now conducts concerts and seminars there. As Christov-Bakargiev notes, the project “illuminates the simple idea that places generate space, and is the region of the possible.” Christov-Bakargiev’s frequent reference to this project throughout the exhibition and its publication acknowledges the work of Szeemann, whose artist-centric approach to the 1972 documenta similarly redefined the landscape of contemporary art through its generous embrace of conceptually-based artistic practice. Wael Shawky’s epic Cabaret Crusades: The Path to Cairo is another standout work that provides perspective on Middle Eastern histories and narratives that disrupt the western, Eurocentric perspective. Completed for dOCUMENTA (13), it is one in an ongoing series of animated films by the Egyptian artist inspired by Lebanese writer Amin Maalouf’s The Crusade Told Through Arab Eyes; this dramatic work is enacted by 200-year-old puppets on strings. Khaled Hourani’s installation, documenting his project Picasso in Palestine (2011), was also among the most memorable works in the exhibition. For this audacious work, the Ramallah-based artist orchestrated the successful loan of Pablo Picasso’s Buste de femme (1943) from the Van Abbemuseum in Eindhoven, the Netherlands, to the Academy of Art Palestine in Ramallah. The painting’s presentation marked the first time that work by Picasso—an icon of modern Western art—had ever been exhibited in the West Bank. Made by during World War I at the height of the Spanish Civil War, the painting carries its own history of pain and conflict. Fascinated by the potential of the work to translate meaning in a vastly different societal context, Hourani documents the painting’s journey, the complex negotiations and processes he pursued to successfully transport and insure the work, and its presentation and reception by the public in Ramallah. He also included footage from newscasts showing the piece guarded by uniformed Palestinian guards as well as a drawing he received from an individual in a local prison for whom the work and its presence powerfully resonated, reflecting his own personal situation. A commitment to “conceptual activism,” Christov-Bakargiev’s term for art that involves rigorous research, staged actions, and projects that challenge institutionalized systems or cross national borders, informs many of her selections throughout dOCUMENTA (13). Another example is work by San Francisco–based artist Amy Balkin. After declaring Earth’s atmosphere public domain, she has launched a multinational petition to add it to the UNESCO World Heritage list. Balkin’s efforts reveal the complexities of collaborative and collective action against global climate change. Another project that underscores these challenges and exposes legal frameworks and systems of government, cultural patrimony, and belief is the ongoing work of Buenos Aires–based artists Guillermo Faivovich and Nicolás Goldberg. Since 2006, the duo has been conducting research and creating projects around multi-ton meteorites originally found in Campo del Cielo in the Chaco region of Argentina. The “cosmic alreadymades” are of cultural and spiritual significance to the region’s indigenous people. One of the largest meteors in the field, “El Chaco,” has been the subject of heated negotiation with the artists and an array of Argentinean scientists and officials who wouldn’t allow the meteor to be moved from its site and presented in Kassel. The artists hoped that El Chaco could be positioned on the Friedrichsplatz near the first and last of Beuys’ oak trees during the run of dOCUMENTA (13). Despite the negotiation’s failure, the site and foundation to support the meteor’s arrival is visible on the Friedrichsplatz and labeled as part of the exhibition. Floyer’s piece is adjacent to Ryan Gander’s I Need Some Meaning I Can Memorise (The Invisible Pull) (2012), one of the most surprising and compelling works in the exhibition. Quietly filtering through the entire ground floor of the Fridericianum, it is a light blowing breeze manufactured by the artist and felt in the passageways, main thoroughfares, and open spaces of nearly empty surrounding galleries. Gander’s resistance in making a “fixed” artwork is echoed by the presentation of a letter by German artist Kai Althoff to the curator, in which he painfully articulated the reasons why he felt overwhelmed at the prospect of participating in this important global survey in an art world dominated by speed, financial success, and fueled by the economic engines of the contemporary art market. 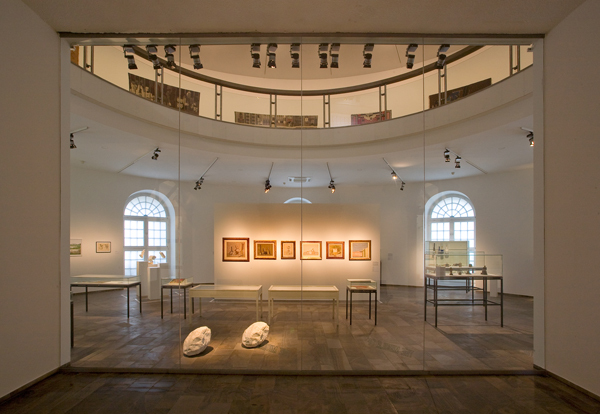 The curator’s self-professed Rosetta Stone to unraveling some of the exhibition’s major ideas and conceptual gestures is affectionately referred to as the “brain”—a small gallery located in the center of the Fridericianum, which condenses Christov-Bakargiev’s chief “lines of thought” and captures the concurrent ambitions and modesty of the exhibition in a glassed-in microclimate. The gallery presents myriad objects from antiquity to the present, of both large and small scale (although mostly small). Their selection was inspired by the societal fascination with objects and a desire to reveal their memories and “troubled histories.” Some of the most notable and fascinating inclusions are the so-called Bactrian princesses, composite stone figures made in northern Afghanistan, Uzbekistan, and Turkmenistan between 3000 and 2000 BC and a collection of Italian painter Giorgio Morandi’s vases, the subject of his creamy still-life paintings of the 1950s. The curator includes what she describes as “damaged” and “destroyed” objects by artists Gustav Metzger and Man Ray, as well as “protest” objects, such as Tamás St.Turbas’ Czechoslovak Radio 1968, a brick crudely painted to look like a transistor radio, and one of hundreds ironically confiscated by Czech police in the former Soviet bloc country during prohibition of radio use. Among the most moving and unforgettable artifacts was a “disguised” object, one of 80 paintings in the collection of the National Gallery of Kabul that painter Mohammad Yusuf Asefi covered with unremarkable abstractions using water-soluble paint in the 1990s. His “conservation” saved these works from the conservative Taliban regime that targeted and destroyed depictions of animals and humans. Among the “innocent” objects included are selections from the 900 postcards painted by Dachau inmate Korbinian Aigner between 1913 and 1960. These formulaic illustrations depict the strains of apples and pears Aigner cultivated while imprisoned in a Nazi camp. Christov-Bakargiev pays tribute to the unlikely artist by planting an apple tree from the single surviving strain in the Karlsaue garden; a similar apple tree is dedicated in Dachau. 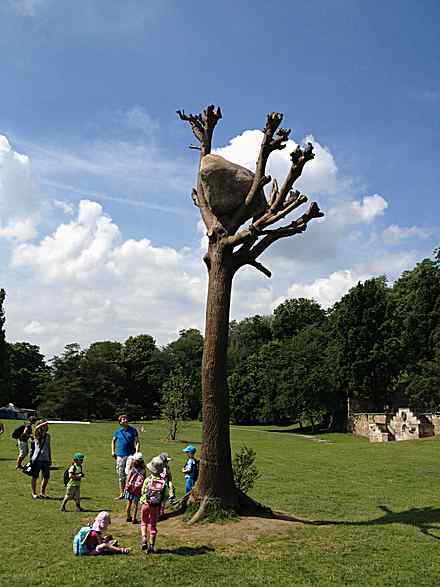 Giuseppe Penone’s pair of boulders juxtaposed in Essere fiume 6 (1998)—one quarried by artist and the other formed naturally by the river—affirm the potency and integrity of the conceptual artistic gesture. 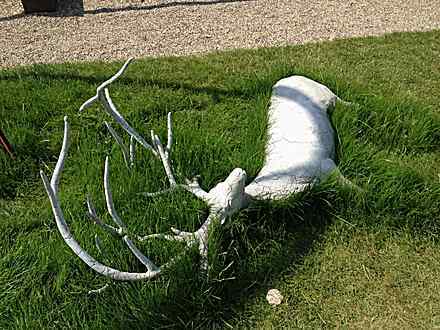 If I were to select one work that singularly encapsulates the complex theses and poetry of understatement that typifies dOCUMENTA (13), it would be the outdoor installation by Pierre Huyghe. The untitled work, comprised of “alive entities and inanimate things, made and not made,” was easy to miss. 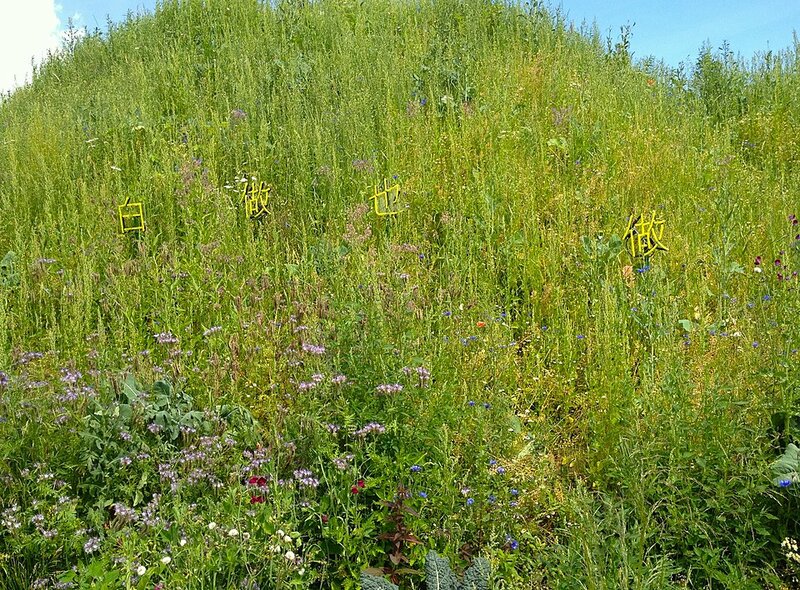 In the composting area of Karlsaue Park, it is marked by a discreet label at the foot of the trail leading to a seemingly abandoned site, which was selected by the artist and barely altered. Huyghe chose to draw attention to the site’s current conditions by enacting some subtle interventions: the addition of caution tape, the frequent roaming of a groundskeeper and a dog marked by a fluorescent patch of color, plantings of marijuana and hallucinogenic specimens, an uprooted Beuys oak tree, and a swarming beehive cultivated on the head of figural sculpture. Huyghe’s emphasis and de-emphasis of certain aspects and conditions of the site are not always clear or readily discernible. As he notes in his artist statement, the “set of operations” that occurs between found and created conditions “has no script.” There is no “choreography,” “organization,” “exhibition,” or “representation.” The existence of a system is “uncertain;” there are “rules” but not “a policy.” Relying on context and open to serendipitous juxtaposition and associative meanings that occur naturally during the course of a day and the presence of visitors, Huyghe orchestrates an experience that has the potential to feed and heighten our senses and awareness. He invites us to engage, if we so desire, in the same processes of examination and discovery that artists do when surveying and responding creatively to the conditions of our existence; he offers fertile ground for creative inquiry and experimentation. In this way, Huyghe’s project serves as a metaphor for the entire exhibition and Christov-Bakargiev’s subtle yet potent curatorial orchestration. Her approach is distinguished by a deep and abiding respect for artists and their individual processes and a commitment to providing generous frameworks of support, frameworks not seen and easily sustained in a success-driven, economically motivated culture. This is what makes dOCUMENTA (13) so refreshing; while everything in the exhibition may not “succeed” and is largely uncommodifiable, what does succeed is the generative culture of expression and iteration that is modeled and privileged. I spent three days in July roaming through the myriad exhibition sites in Kassel, taking in and processing what this thoughtful and at times unexpected assembly of artistic projects and objects might say about contemporary culture and our time as well as the places I know, thought I knew (like Kassel), and clearly don’t know. Mindful of the fact that I would never see key aspects of the exhibition in Afghanistan, Canada, and Egypt, I was both humbled and heartened by the possibility and impossibility of experiencing and knowing these locales. Yet it is through the works of artists, and their thoughtful presentation in forums like this, that lenses to knowledge and experience and other “phenomenal spatialities” are possible. This exhibition restored my faith in the power of contemporary art to reflect and shape our understanding of the world. It boldly affirms the important role that artists serve in society and underscores the freedoms they should be afforded each and every day. Artists must exist and operate freely outside of dogma and the dogmatic, which is why we need them to feel free, supported, and empowered to do so, everywhere. Olga Viso is executive director of the Walker Art Center. 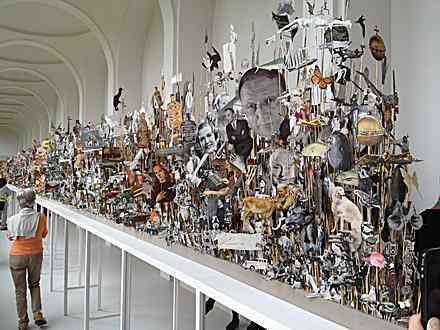 dOCUMENTA (13) is on view through September 16, 2012. Various artists, “The Brain.” Photo: Roman März. 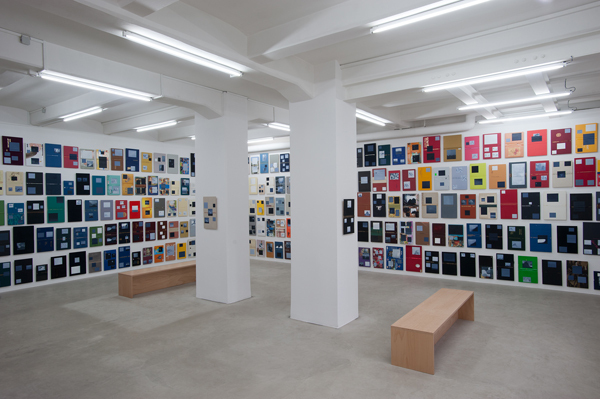 Paul Chan, “Volumes – inncompleteset,” 2012. Oil on fabric, paper, and cardboard. Dimensions variable. Courtesy the artist; Greene Naftali, New York. Photo: Nils Klinger. Trisha Donnelly, “Untitled,” 2010–ongoing. File, courtesy Trisha Donnelly. Commissioned and produced by dOCUMENTA (13). Photo: Nils Klinger. Hannah Ryggen, “Drommedod (Death of Dreams / Tod der Träume),” 1936. Wool and linen, 225 × 272 cm. Nordenfjeldske Kunstindustrimuseum, Trondheim. Photo: Roman März. Sam Durant, “Scaffold,” 2012. 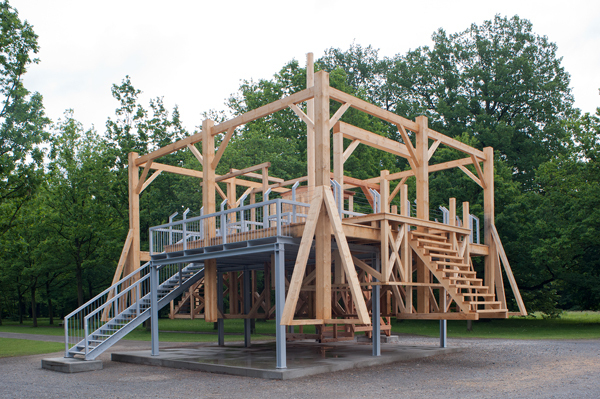 Wood, metal, 10.3 × 14.4 × 15.8 m. Designed by Sebastian Clough with punkt vier architekten and Klute & Klute Ingenieurbüro. Courtesy Sam Durant; Blum & Poe, Los Angeles; Sadie Coles HQ, London, Paula Cooper Gallery, New York; Praz-Delavallade, Paris. Commissioned and produced by dOCUMENTA (13) with the support of Blum & Poe, Los Angeles; Sadie Coles HQ, London; Paula Cooper Gallery, New York; Praz-Delavallade, Paris. Photo: Nils Klinger. Bani Abidi, “Death at a 30 Degree Angle,” 2012. 2-channel video installation, 10 min., Commissioned by Sharjah Art Foundation – 2011. Photo: Krzysztof Zielinski. Kassel, September 2012 – Still a few days to see dOCUMENTA(13), one of the most important art exhibits that takes place every 5 years in Kassel, Germany. 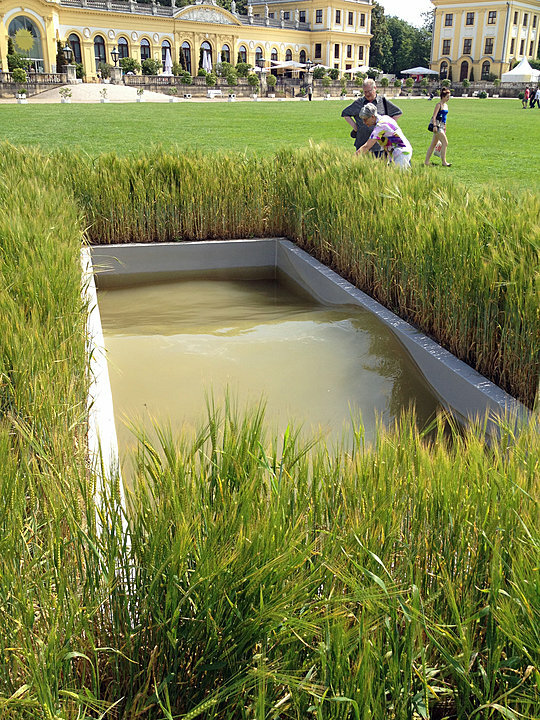 Allow yourself sometime to explore multiple venues and hundreds of artworks and art projects. If you have three days go to (no particular order) Fridericianum; dOCUMENTA-Halle, Ottoneum, Neue Galerie, Hauptbahnhof, Off the Main Sites and Karlsaue Park. All to be explored from A to Z. If you have less than three days then go to the Ottoneum, the Hauptbahnhof, Karlsaue Park and to the Off the Main Sites. The two itineraries must be approached with different attitudes. The first one embeds the I-am-going-to-do-this-no-matter-what kind of attitude. The second one is for the I-am-going-to-experience-this-and-enjoy-it kind of attitude. There is also a third option: the exhibit within the exhibit. A tour exploring past and current dOCUMENTA(s), getting to know each edition through what became a permanent presence in Kassel’s urban fabric. The current dOCUMENTA will also help you shaping the exhibition within the exhibition tour through the many projects that homage or reference existing artwork made in occasion of its past editions, in particular Joseph Beyus’ and Walter De Maria’s. At the end, it all contributes to an ongoing influential pallette from which everyone get to choose their favorite color. If you will get to Kassel by train most likely you will end up at Kassel-Hauptbahnhof. Then, let’s start here. At the Hauptbahnhof you find Janet Cardiff, William Kentridge, Michael Portnoy, Critical Art Ensemble and Susan Philipsz among others. They all contributed to the transformation of the dismissed locations of the train station into an evocative and inspirational place, but once you are done with Janet Cardiff & George Bures Miller videowalk, you will not look at the Hauptbahnhof in the same way ever again. At dOCUMENTA artists have engaged in a multitude of themes, many of them responding to Kassel’s history and memories, which it is really something you can’t ignore. Each of the projects though is different and anti-rhetorical. 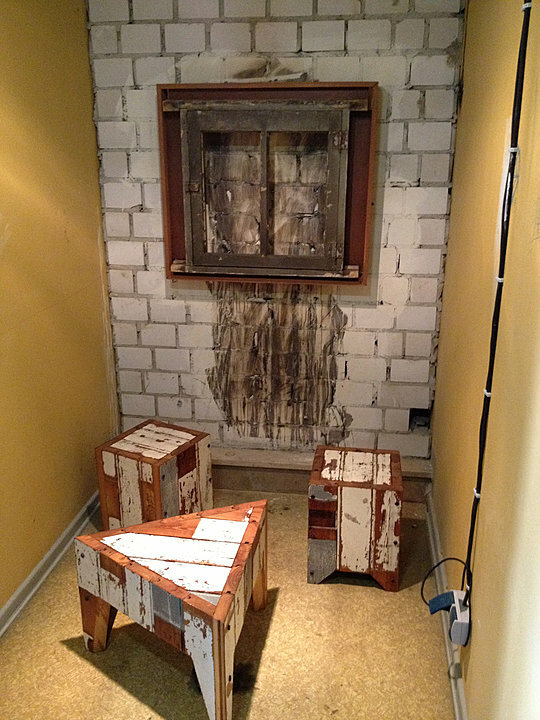 The result is that more tiles joined the puzzle of the painful history of WWII and its aftermath. In instance the work of Sanja Iveković which drew inspiration from two historical documents: one is a list of reasons for imprisonment found in the former monastery Breitenau near Kassel and one is a picture published in the Hessische Volkswacht in April 1933. The first document led to an installation throughout Kassel of posters reproducing the reasons of imprisonment. 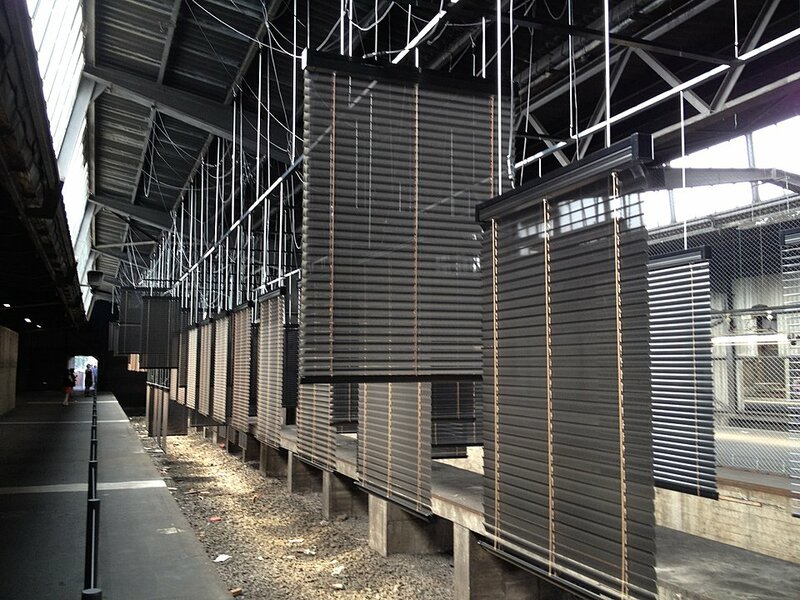 The installation is titled “The Disobedient (Reasons for Imprisonment)”. The second document inspired the moving piece in the Neue Galerie called “The Disobedient (The Revolutionaries)” which includes a list of individuals who have resisted and oppression in the past and current century. At the Ottoneum Claire Pentecost, Amar Kanwar and Mark Dion’s projects are exhibited under the overall theme of seed and the making of earth, life, food, art, stories, intra-action and worldliness. The artwork has been realized also in response to an object in the permanent collection of the Ottoneum. For instance, Claire Pentecost displayed her “Worm composting cabinet” side by side with Richelsdorfer Mountain Cabinet from 1783 which contains local stones showing the compressed layers of the mountain near Kassel. Creating a perfect replica of the eighteenth century piece, Pentecost realized a soil making machine. 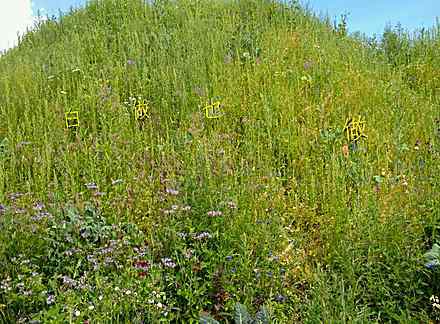 In and around the Ottoneum, Pentecost also presents “When you step inside you see that it is filled with seeds” in form of vertical beams filled with soil and designed for the intensive production of vegetable for the dense, land-poor communities. 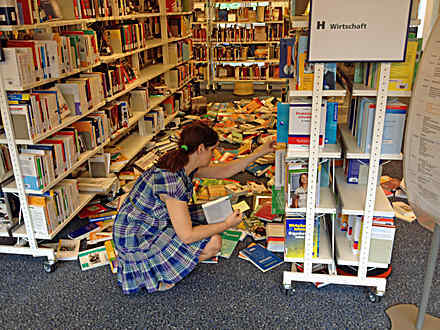 Investigating into the institutional structures that organize and control knowledge, Pentecost’s work is a good opportunity to think about money, food, environment and resources exploitation. In the same venue Mark Dion site-responsive installation is now a permanent addiction to the Ottoneum. He created a new cabinet display for the Xyloteque adding five more species of trees and revitalized an extraordinary tree encyclopedia crafted by Carl Schildbach from 1771 to 1799. 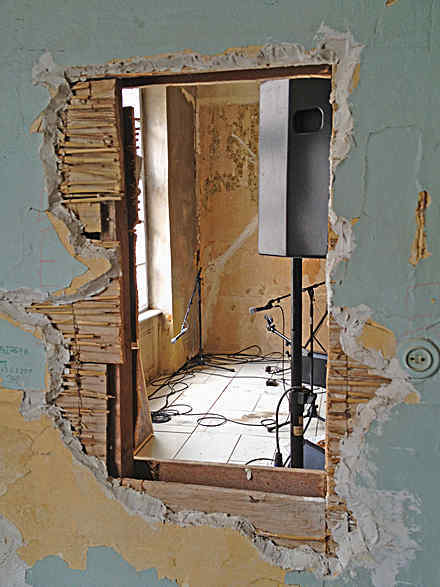 Another significant intervention which will remain permanently on view is Theaster Gates’ “12 Ballads for the Huguenot House” . The Huguenot House is a former bourgeois home and hotel now turned into a functional space to live, share, work, and enjoy and most of all, in the artist’s intention, to encourage cultural, bureaucratic and political conversations around the marginally employed and excluded artists. Due to the dimensions of the exhibit, that unfolds throughout Kassel city center, and due to the numerous artists featured, a comprehensive post about everything would be ambitious to do, but also unnecessary. dOCUMENTA(13) should be experienced as a journey, not only through contemporary art but through life. It combines all the elements of our existence as human being. 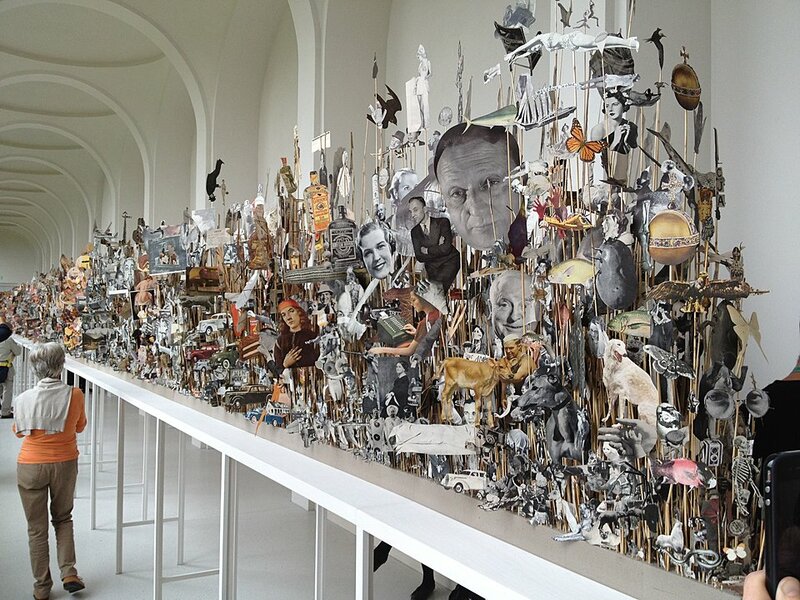 If you decide to see dOCUMENTA(13) drop your must-seen-marathon attitude and enjoy what you can see. It is all worth seen and it all requires maximum attention to be understood. Every project, performance, installation or film will touch you, make you think, leave you with questions, lots of questions and no answers. The city-wide exhibit offers the opportunity to bump into art almost at every corner, so why bother? Just enjoy. p.s. 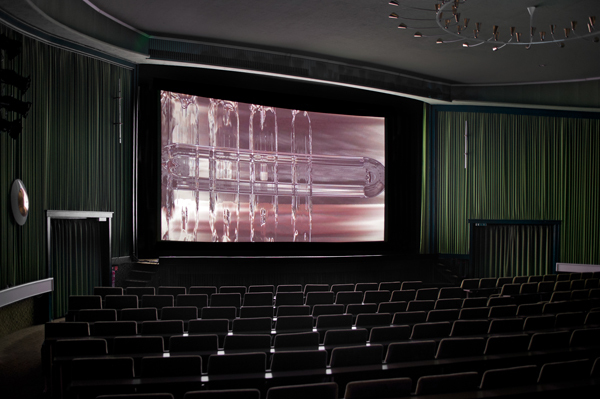 After the daily program do not forget to check out the Bali Cinema for screenings. Sehr neu.Danke. Toll. 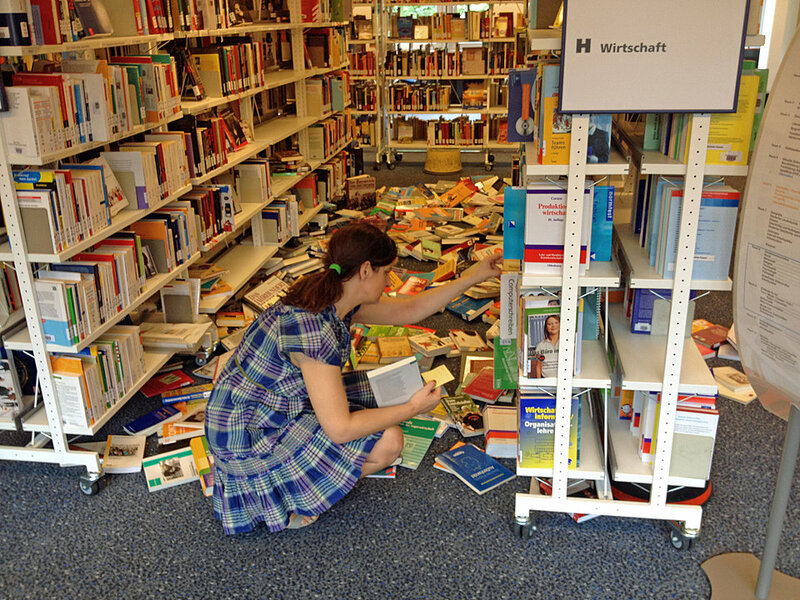 Das habe ich gesucht. Wertvolle Mühe. Empfehlenswert und reich an Content. Glaskunst Fanatiker.